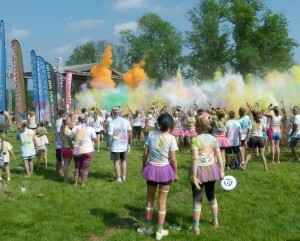 The Color Run was in Hershey today. The weather was excellent this morning for the first day of the two day event. The run is a 5K event and was adjacent to Hershey Giant Center and Hershey Park. The organizer Nicole Karnash of Harrisburg has a daughter with a rare neurological disorder and spoke on stage with other families and their children about Rett Syndrome. She reported that the Color Run is one source of funding for the non-profit Rett Syndrome.org. Pennlive reports that up to 20,000 runners are raising money for Rett Syndrome this weekend. The Color Run contributes to non-profit organizations, but it is a for-profit event.